EXCLUSIVE $9000 Full Tilt freeroll. 100% / $600 Full Tilt Poker referral code. Only site to feature Rush Poker. Endorsed by a large range of poker pros. Special avatars at the poker tables. Animated last hand replay function. Superb Full Tilt point bonuses. Best software we have ever tested. Loads of action in Omaha. Lacks live chat and telephone support. One of the biggest names in online poker, Full Tilt Poker is an online poker room designed with the input of professional poker players in an effort to create a superior online poker site that caters to the needs and expectations of serious poker players. From the lobby’s carefully planned game selection filters, to the exorbitance of Full Tilt’s promotions and big money tournaments, Full Tilt Poker is a place for the most discerning of online poker players. Frequented by such poker heroes as Phil Ivey, Patrik Antonius, Chris Ferguson, Gus Hansen and Jennifer Harman; Full Tilt Poker’s slogan, “Learn, chat and play with the pros,” is an exact reflection of what Full Tilt Poker is all about. With extensive lessons on situational poker strategy and essential bankroll management skills, Full Tilt Poker is avidly educating and grooming the newest batch of future professional poker players. With first-rate, independently developed online poker software that is second to none, Full Tilt Poker’s fully-featured, highly customizable, and reliably stable software is constantly updated with the latest features in the industry. The lobby has undergone several improvements over the years to optimize navigation and usability, evolving into a unique and efficient filter-based menu system. Geared for flexibility and personalized convenience, Full Tilt Poker’s table options allow a vast array of preference settings for both aesthetic and performance oriented tweaking. Multi-tabling functionality supports game play at up to 18 re-sizable tables simultaneously. Full Tilt Poker’s 2009 introduction of Rush Poker tables has eliminated the boredom of folding pre-flop, then waiting for the hand to play out; instead sweeping the folded player immediately to another table to be dealt into a new hand. The Full Tilt Poker online poker software is also available for download on Mac OSX 10.4 or higher. Despite the fact that Full Tilt Poker is no longer able to accept real money online poker players residing in the US, Full Tilt still holds a spot at the top of the online poker traffic ratings. Player traffic at Full Tilt poker is significant even at off peak hours, providing round-the-clock action at the cash games, Sit and Gos, and the 24/7 tournament schedule. There is no shortage of standard and unique tournament styles available to players at Full Tilt Poker. On Demand Tournaments provide the larger payouts of multi-table tournaments with the unscheduled convenience of Sit and Gos, beginning the tournament as soon as the minimum number of required entrants have taken a seat, and allows late registration through a specified number of levels. Matrix Tournaments at Full Tilt Poker are Sit and Gos played at four different tables at once against the same nine opponents at each table. In addition to the unique tournament formats offered by Full Tilt Poker, online poker tournament lovers will also find the usual guaranteed tournaments, knockout bounty tournaments, shootout tournaments, and rebuy tournaments. Live event qualifiers are abundantly available at Full Tilt Poker prior to major live poker tournaments, and Full Tilt Poker runs its own online poker championship series – FTOPS. Full Tilt Poker offers one of the most extensive game selections in online poker, with the traffic scores to find action even in the Fixed Limit Omaha Hi-Lo and Razz games. The Texas Hold’em cash games are well stocked with active players in No Limit, Fixed Limit, and even Pot Limit variations. Pot Limit Omaha is another favorite in which there is always plenty of action to be found. While Full Tilt Poker offers such mixed games as 7-Game, HORSE / HEROS, HOSE, HO and HA, finding a populated table can be challenging at times. A haven for professional poker players, grinders, and aspiring online poker pros; the competition at Full Tilt Poker can be rather tough in the mid-level stakes, with the strength of opposition only rising exponentially from there. However, there are plenty of new players signing up with Full Tilt Poker daily, clinging mainly to the micro-limits, where the softest games can be found. Reading up on table selection and poker strategy is highly recommended to ambitious, inexperienced online poker players. Full Tilt Poker referral code free9600 will get you a generous sign up bonus of $600 with a match of 100%. For each dollar raked from a pot, every player who was dealt cards for that hand will earn one point. You can earn partial points if less than one dollar is raked, and you can earn up to three points per hand. Each point is worth $0.06, so you can earn up to $18 per one hundred hands. The bonus amount will be automatically credited to your Bonus Account where it will be held and released to your cash account in increments of 10% of your initial deposit, or $20, whichever you earn first. So if you do a one-time deposit of $100, each $10 (10%) earned will be instantly released into your account. Deposit the full $600 and your account will get credited for each $20 of bonus earned. At three points per hand, each $20 increment can be earned in fewer than two hours of play at only one table. For detailed instructions on how to use the code see our Full Tilt Poker referral code step by step guide. In 2007, the EveryPoker.co.uk team added a new, exclusive $9000 freeroll. You get access to it automatically once you’ve entered our Full Tilt Poker referral code. Full Tilt Poker offers a simple, point-based loyalty reward system in which players earn FTPs by participating in raked cash games and paying tournament entry fees. FTPs can be used to purchase merchandise from the Full Tilt Poker online store, or for entry into Full Tilt Poker’s exclusive FTP tournaments. Double or triple points can be acquired during Full Tilt Poker daily Happy Hours at designated cash game tables. As one of the largest and most successful online poker sites, Full Tilt Poker is able to offer a huge assortment of regular and ongoing online poker promotions. Satellites to major live poker tournaments, and qualifiers for special televised poker cash games and tournaments are just the tip of the iceberg. 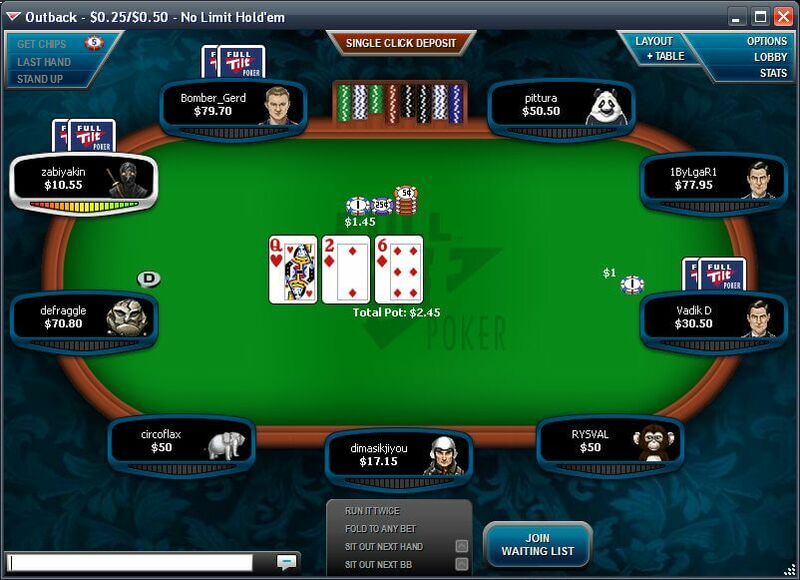 Players can also gain entry into Full Tilt Poker’s own online poker series, FTOPs, with little to no investment through designated freerolls and satellites of varying cost. The Sunday Brawl, $750,000 Guaranteed and the Sunday Mulligan draw a huge turnout every weekend. Full Tilt Poker’s Friday Night Fights is a weekly $500+$30 $75,000 Knockout bounty tournament. In addition, players who manage to knock a Full Tilt Pro out of any multi-table tournament of 30 or more entrants wins the Bust-Out Bounty: a free t-shirt and a refund of the player’s tournament buy-in amount, up to $200. Knowledgeable and timely customer support is available by email at Full Tilt Poker. 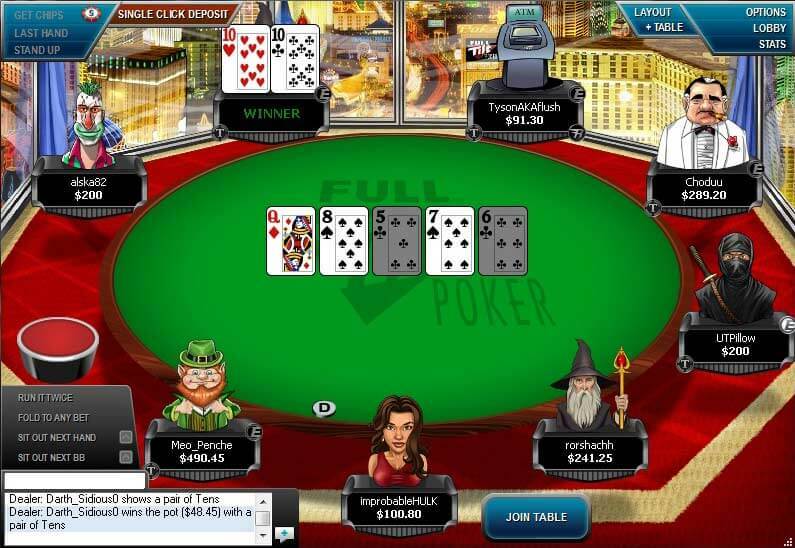 For information concerning downloading, installing, and using the Full Tilt Poker software, Full Tilt Poker provides a fully detailed getting started walkthrough on their website, complete with screen shots. Deposits: eChecks, Visa, MasterCard, Moneybookers, NETeller, Click and Buy, InstaDebit, EntroPay, WebMoney, Click2Pay and wire transfer. Cashouts: Visa, Moneybookers, Click and Buy, InstaDebit, Click2Pay and check.